Leading manufacturer of refrigerated and specialised vehicle bodies Paneltex is exhibiting three flagship refrigerated vehicles from its diverse product range at this year’s CV Show. Leading the way on its stand will be the latest 26tonne GVW Iveco Stralis dual temperature rigid distribution chassis that will be specified with Paneltex dual temperature refrigerated body and a Carrier TRS refrigeration system. The vehicle engine powered Carrier TRS multi-temperature refrigeration system provides highly effective cooling driven by the Euro 6 truck engine, making it both clean and efficient. Following the recent accreditation of Paneltex by Ford to its exacting QVM status, Paneltex is exhibiting a new Ford Transit chassis cab with light-weight refrigerated bodywork, designed specifically for urban food or pharma distribution work. Type approved to ATP Class C standard for international work, this vehicle will be fitted with a ThermoKing V300 over-cab refrigeration system integrated within a Paneltex Direct Air cover system to provide either a chilled or deep frozen environment. A high payload and cyclist/pedestrian side protection features add to the appeal of this vehicle for home delivery work. 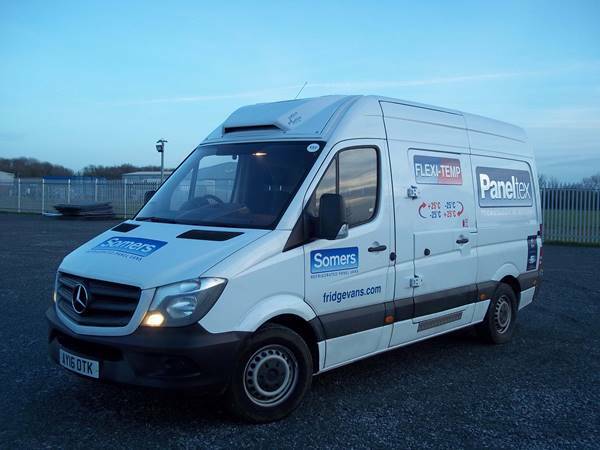 The three vehicle line-up is completed with a Paneltex Somers “Flexitemp” Mercedes Sprinter van, fitted with a GAH dual temperature reversible refrigeration system. Offering industry-leading standards of insulation, this ATP Class ‘C’ approved panel van conversion offers the ultimate in multi-temperature capability for the most arduous of operations.